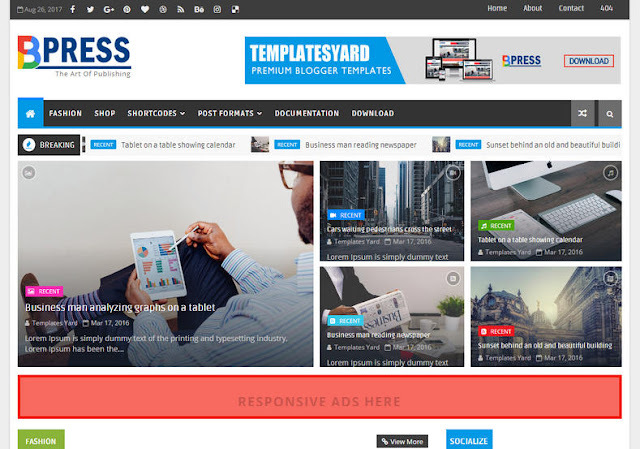 BPress Magazine Blogger Template is a magazine type seo ready blogger template with 12 different types of content based featured widgets. It is an advance blogger template with tons of built in features. This template is manly focused for news blogs but also can be used for tech, review, movie, howTo, sports, niche, authority, schools, institutions etc. This is a heavily optimized template and no other template can beat it in terms of responsiveness, seo ready, ads ready and fast loading. This is one of the best magazine blogger template available on internet, with some unique features and professional set of widgets it will help you to create a website on any niche. It is a cross browser compatible template and will work absolutely fine in every modern browser. It comes in blue, black and white color combination which can be customized through blogger template customizer, not only color but you can also customize background of individual elements like menu, footer and headings. This is a featured and premium looking template which comes with tons of professional and customized widgets, after applying this template on your blog it can compete with any wordpress theme in terms of content management, professionalism and premium optimization. Seo Ready, Ads Ready, Magazine, Responsive, Fast Loading, Browser Compatibility, Drop Down Menu, Adapted From WordPress, News, Technology, 3 Columns Footer, 1 Right Sidebar, Social Bookmark Ready, Multi Colors, Post Thumbnails, Breadcrumb Navigation Ready, Elegant, Email Subscription Widget Ready.